You can make rills of threads with this Thread Rolling Machine and you can sell it in the market or can supply orders. You have to buy threads from market. It is available in of Barobazar, Basirhat, Sector-V area in Kolkata. The role of paper which is needed to make the rill of threads is available in the market of Rajabazar in Kolkata. At first you have to cut the paper and make rolls with it. You can make 4 or 6 pieces of thread rill with this Thread Rolling Machine. Now put the roll of paper on the bobbin of the machine and put the thread in the indicated place of the machine. Then start the machine. 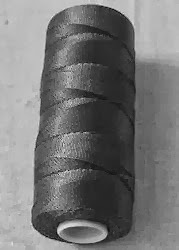 Roll of thread will be made automatically. It needs 1 hp motor and 220 volts to operate the machine. The price of the Thread Rolling Machine is approximately Rs. 7000 and the price of the motor is approximately Rs.2, 500.